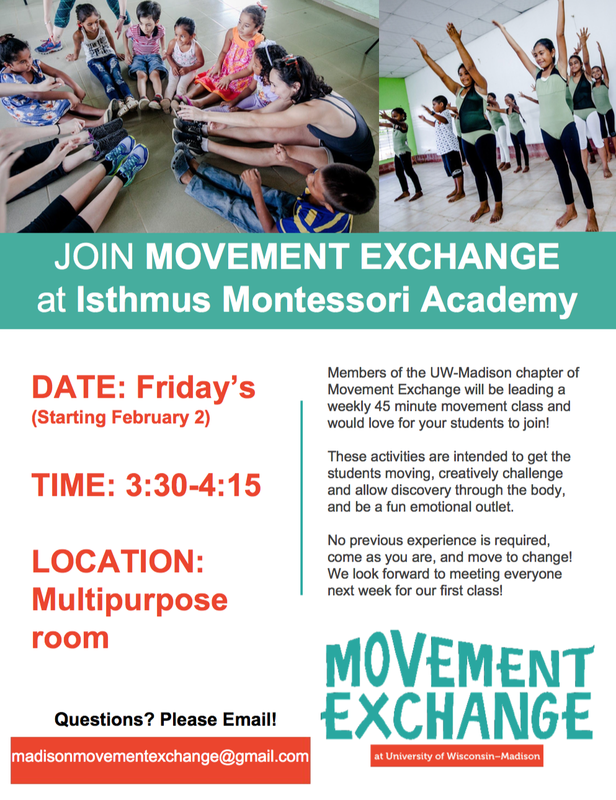 JOIN MOVEMENT EXCHANGE at Isthmus Montessori Academy! Members of the UW-Madison chapter of Movement Exchange will be leading a weekly 45 minute movement class and would love for your students to join! These activities are intended to get the students moving, creatively challenge and allow discovery through the body, and be a fun emotional outlet. No previous experience is required, come as you are, and move to change! We look forward to meeting everyone next week for our first class! 1. Please remember that Thursday 2/8 is a half day for Primary, Elementary and Adolescent. Pick-up will be at NOON! Nido and YCC will have regular full day attendance. 2. Friday 2/9 there is NO SCHOOL at all levels. 3. We will have childcare available for your child(ren) during your conference appointment. Please find the Parent/Teacher conference Sign Up Genius below. Once you have signed up be sure to write down your time(s). You can click on the link(s) that correspond with your child(ren)’s program level in order to select a time to meet. You will find when you choose a time, you are only able to select one option, so please make sure that the time will work for you before it is saved. Upper Elementary (Ms. Melissa): For this classroom there are times on Thursday 2/8 only. If at all possible, Ms. Melissa would like each student to show their own books and work for the second half of the conference. Lower Elementary (Ms. Carrie): For this classroom there are times on Thurs 2/8 and Fri 2/9. Please pay attention to the day and time that you choose and write it down. If at all possible, Ms. Carrie would like each student to show their own books and work for the second half of the conference. Primary Mendota (Ms. Brittany): For this classroom there are times on Thurs 2/8 and Fri 2/9. Please pay attention to the day and time that you choose and write it down. Primary Monona (Ms. Keerun): For this classroom there are times on Thurs 2/8 and Fri 2/9. Please pay attention to the day and time that you choose and write it down. Adolescent (Ms. Allison): Ms. Allison will reach out to parents individually to schedule a meeting time. As always, if you have any questions, please feel free to call or email! Come join IMA’s Elementary students as we play board games and work on puzzles together, in celebration of Groundhog Day. We’ll provide games, and you can also bring your own. All ages are welcome! Friday, February 2nd, 3:00-5:00. Attention: Opportunities to help this week! Hopefully this finds you well and echoing our news of celebration regarding IMA becoming a public school in 2018! As our school community turns towards positive changes of public access, we welcome the opportunity to do the heavy lifting this transition will require. This effort will be the collaboration of our existing school community as well as the growing student body and their families. Come to the FTO meeting on Tuesday, January 23 and bring a notebook! Sign up to canvas surrounding neighborhoods. Provide childcare for canvasing groups. Identify opportunities for us to speak to interested groups or at events. Remember this is good news for all children within our community as we work towards our ultimate goal of becoming part of MMSD. Please let us know if you have any questions. We are here to listen and help in any way that we can. Here is a reminder of the days IMA will be closed during the Spring semester. The weather is truly invigorating! In learning that the weather will remain a bit brisk through early next week, we have decided to move the PE ice skating trip at Tenney Park to Thursday, January 18 in the afternoon. We have also learned of an opportunity to make this a service trip! Madison Parks System is doing a winter clothing drive. It was no surprise that the children were delighted at the idea to be able to serve the community. If you have winter clothing that you are able to donate to their winter clothing drive, please feel free to send your child to school with the donation clothing on the 18th. We shall bring them with us, and add the clothing to the Tenney Park collection spot. You should be receiving a permission slip Friday at dismissal. If you have any questions, please let us know.